Wildcat Band Member. UK Freshman. Cancer Survivor. At the University of Kentucky, the Wildcat Marching Band is one of the most respected organizations on campus. They bring an incredible amount of pride and energy to any event they attend and are filled with some of the best students on campus. One of those students is freshman trumpet player, RJ Hijalda. RJ isn't your typical student though. He's been through more than most freshman students will ever go through in their lives. In 2011, Hijalda was diagnosed with Stage IV A Hodgkin lymphoma as a freshman in high school. The next few years would be filled with chemotherapy, doctor's appointments and a long road to recovery. However, he would never let his goals and dreams be sacrificed because of his new reality. RJ pushed through cancer and now is facing a new test. This weekend he will be a morale member of the DanceBlue dance marathon at Kentucky. DanceBlue is the University of Kentucky's 24-hour no-sitting, no-sleeping dance marathon that benefits the Golden Matrix Fund and the DanceBlue Kentucky Children’s Hospital Pediatric Hematology/Oncology Clinic. He will have to make sure that the dancers at the dance marathon are supported and encouraged to keep going no matter what. Can you imagine a better moraler for a dancer? 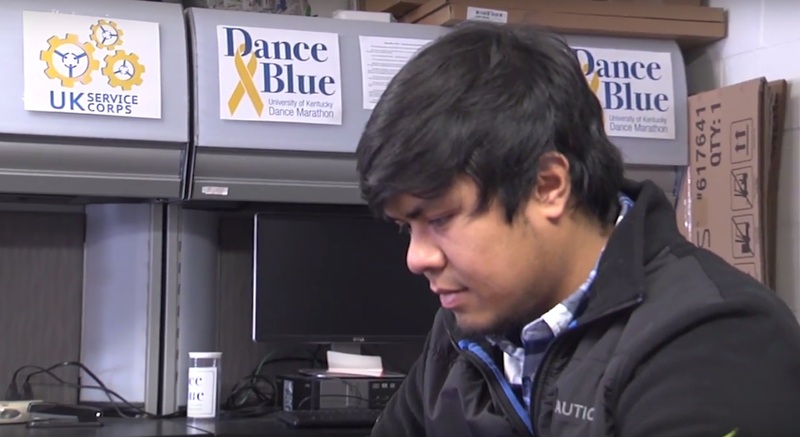 Since it's start in 2006, DanceBlue has raised more than $8.2 million. Good luck RJ and thank you for being a great representative of the college band world! We'll be rooting for you and all Wildcat Band Members who will be dancing at UK this weekend.